Early in 1998, the Utah Highway Patrol made a grant request through H.I.D.T.A. to implement the department’s first canine program. Highway Patrol troopers have had tremendous success at locating and seizing illegal controlled substances using conventional investigative tactics, but the administration felt they could improve upon the organization’s criminal interdiction success if a canine program were developed. Luckily, the department’s grant application was approved. It has long been recognized that a well trained police canine can be very effective at detecting hidden controlled substances being transported in vehicles or cargo. The following is a chronological record of the canine program’s implementation. Interested troopers were requested to apply for consideration as potential canine handlers. Selection of handlers was based upon resumes submitted and oral interviews conducted during March and April of 1998. A decision was made to place the canines and their handlers in the rural areas of the state where troopers had already had some criminal interdiction success. The rural areas selected were known to be drug smuggling corridors. Three troopers were ultimately selected to work as canine handlers. In May 1998, the grant money became available and steps were taken to begin purchasing the dogs and equipment needed. Sgt. Wendell Nope, P.O.S.T. Service Dog Training Supervisor, decided on the breed of dog to be used (Belgian Shepherd Dog commonly known as Malinois) and traveled to Holland to personally select the animals for use in this program. During the months of May, June, and July 1998, the troopers and their assigned dog attended “drug dog” training at the Utah Police Academy. The dog handlers and canines successfully completed this training and were certified. The three canine teams were deployed to their respective areas for a trial period. During the month of August, one of the troopers’ dogs demonstrated an unsuitable temperament for police work and was removed from service. A replacement canine was subsequently obtained, trained, and issued to the trooper. Toward the end of October 1998, all three dogs and their handlers returned to the Utah Police Academy for patrol and service dog training. 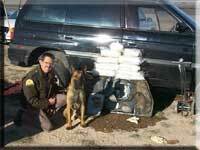 Upon completion of this training the canine teams returned to their respective assignments in rural Utah.